The app concept continues to grow: photo social-networking site Flickr has announced an App Garden where developers can show off their Flickr-friendly wares. Flickr has had an open Application Programming Interface (API) since 2004, allowing developers to create applications that interact with the site. The App Garden provides an organized place for these homegrown creations to thrive and find new audiences. App designers can obtain a key, get to work right away, and then publish their apps. An app can be a free-standing Website, a program for your desktop machine, or even software for your smartphone. All the apps are tagged for easy searching and the site is tidy and easy to navigate. Existing applications already run the gamut, allowing Flickr users to view, manage, and play with content in a variety of new ways. For example, there is the very functional Mobile Fotos, which is a browser and uploader for the iPhone; among the myriad of photo viewing apps is Flickriver, which generates a seamless stream of images against a black background; and Picnik gives Flickr regulars a Web-based way to edit photos and add effects. There has been no shortage of speculation and outright condemnation of Apple for its opaque app approval process. 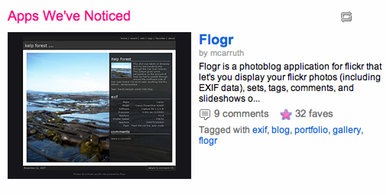 In the case of Flickr’s App Garden, however, there is no formal review and approval. Flickr does ask that developers comply with their community guidelines and copyright restrictions, but Flickr takes no responsibility for third-party apps. Indeed, when you click on an app in the garden, you leave the site and get a pop-up alert before reaching the app’s own Website. I’d expect the App Garden to grow in leaps and bounds (though perhaps not quite as fast Apple’s App Store, which has already reached the astounding milestone of 100,000 available apps). Application ecosystems will probably continue to multiply going forward, as there’s no shortage of late-night programmers with big dreams—just as there's no dearth of users who like to play around with apps, especially when the price is free.